MEDrefer "Find a Specialist... Fast!" 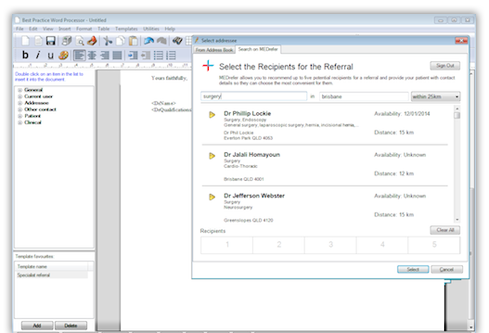 Securely issue and track referrals that work the first time from within your familiar clinical interface. Registration for MEDrefer is easy, and completely free for GPs. Simply provide your email address (which becomes your MEDrefer username) and choose a password to immediately start using MEDrefer to securely issue and track your referrals with notifications sent direct to your Bp inbox. Searching for new Specialists and Allied Health Professionals has never been easier. Simply enter the discipline and a location to see the breadth of our database of referees. But before you issue a referral to a patient you can see MEDrefer referrals in action by sending a test referral. Once you’ve sent a referral via MEDrefer, we’ll keep you informed via your Bp Inbox when significant changes occur, e.g. when accepted, cancelled, if the patient did not attend or when a report is received. The Patient's Correspondence Out folder always shows the referral’s current status. Join MEDrefer and radically improve your referral process. A variety of pricing plans are available to meet the needs of your practice.